By the dead of Albert Hoekstra. 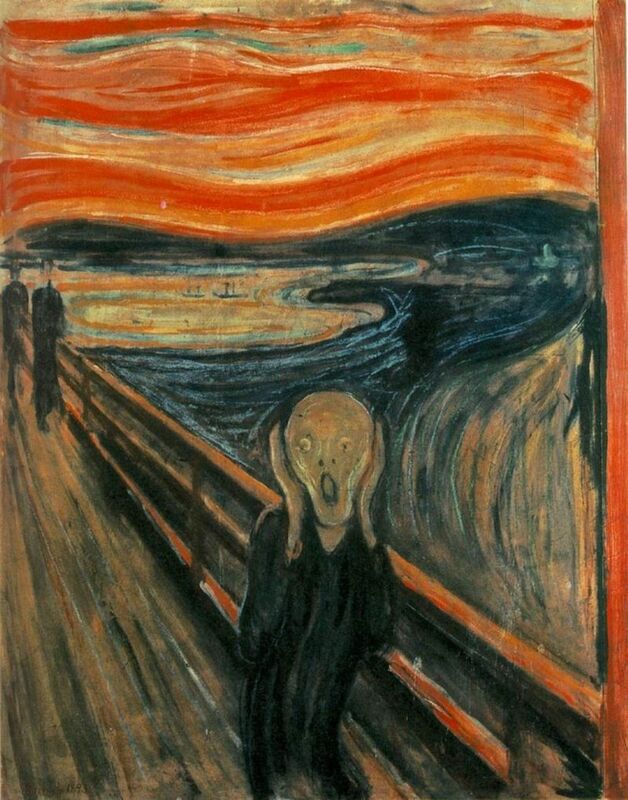 Perhaps one of the most intense paintings in art history; ‘The Scream’, or in Norwegian ‘Skrik’ by Edvard Munch. The sky with the sun setting, the landscape, they all cries out in bright colours. And the figure holding its hands over its ears in despair, its mouth open in a wordless soundless scream from the heart. This image has overwhelming impact. When the news came from Sri Lanka on September 5th that Albert had passed away, we experienced the same overwhelming despair. A cry of denial, bewilderment and raw pain. Especially for you, Annemarie, Mrs Hoekstra, Judith, René, Peter Paul and the rest of the family. So many others share this cry. Friends, colleagues, brothers and sisters of the Dutch Reformed Church and so many more. Where was He then, on September 5th? Was He present? And is He still present? Is He with those left behind in such sadness? These questions are certainly justified, but let’s first look at something else. We live in a world where things are amiss. We all know that. We don’t need the media to confirm what we already know. We have lost something – paradise. This is why we’re surrounded by death, destruction, hatred and selfishness. We’ve lost paradise and are not able to win it back. What we are left with is a sigh, a longing in our hearts for the paradise lost. This is why we fight against injustice and inequality. This is why our hearts cannot come to terms with a life full of potential suddenly cut short. Full of energy, sharing passion and love, love for people, love for life, life in service of harmony, life in and through faith. Is it just a cry of desperation and a cry of fear? It seems so, because there is no way back to the garden of Eden. But, there is a road ahead. Let us look at the painting by Munch next to the words Paul wrote to the Romans in chapter 8. What he writes is so apt: ‘For we know that all creation has been groaning as in the pains of childbirth.’ These are the labour pains of God’s new creation. Not only creation sighs and suffers, says Paul. Just like the desperate figure in the painting, his hands clasped to his ears, we who have received the Holy Spirit in advance also sigh as we wait for the revelation and release from our mortal existence. Not that Munch saw this, but perhaps he sensed more than many believers, the cry of creation in need reverberating throughout air, land and water. We too sigh. We too suffer. Not just passively. Above the desk in Albert’s study, he had a quote by Anselm Grün (from the book “Mit Herz und allen Sinnen: Gute Gedanken fur jeden Tag”), combined with a quote by H. Fische Carl: ‘A man unable to suffer is unable to experience joy. Where there is no suffering, there is no great joy.’ This suffering is not passive, something that happens to you. Instead it’s suffering through crying and mourning, allowing the sadness and pain into your life. Our lives would become so poor and our feelings so shallow if we didn’t allow pain to effect us. We return to the question: where was He? He that revealed himself to Moses as ‘I am there’, was He there? A more complete representation of His name is: “I am there as I shall be there’. Because we do not know precisely how He is there. We don’t determine the how. He is not bound to our presuppositions, desires or demands. We prefer to see Him as the One who prevents our suffering, however, He joins us in our suffering. He is with us. He enters into our despair and powerlessness and in His love we are joined with Him. He does not remain in suffering with us, but endures the labour pains with us and shows us light and offers us access to God’s new world. Gods children are gifted with freedom and splendour. Albert lived in freedom and splendour and enjoyed his life here to the full. The scream is not the last word. The last word is joy. Joy and amazement. Amazement beyond our wildest dreams. P.S. The original German title Munch gave his painting is “Der Schrei der Natur” (The Scream of Nature) which brings it even closer to the creation groaning and suffering that Paul writes about in Romans 8,22.